LOS ANGELES, CA (Laserfiche) Jan. 8, 2009—Laserfiche announced today that a thousand people will “Power Forward” into 2009 at the 10th annual Laserfiche Institute Conference to extend their success enterprise-wide by learning about the latest innovative technologies for streamlining services, increasing productivity, and cutting costs. The conference will be held at the Hilton Los Angeles Airport January 12-14, 2009. The conference will equip participants with tips and tricks to grow and succeed. It is also a great opportunity to learn about enterprise content management (ECM) with Laserfiche Rio™, an intuitive, easy-to-use system that builds on existing Microsoft infrastructure, and see how Laserfiche has refined business process management with the soon-to-be-released Laserfiche Avante™. Moreover, Laserfiche 8™ provides IT professionals with a versatile solution that incorporates standard Microsoft tools for management and integration—particularly Microsoft SharePoint®. It also includes a redesigned business automation module that’s built on the Windows® Workflow Foundation engine. Kodak is the Premier sponsor for this year’s conference, with HP as the Platinum sponsor, and Canon as the Platinum Lab sponsor. The Laserfiche Gold sponsor is eCopy. Additionally, industry hardware leaders and distributors Fujitsu, Panasonic Scanners, Visioneer, and NewWave Technologies, together with several Professional Developer Partnership Program members will be exhibiting. Laserfiche Institute Conference participants represent a multitude of organizations across a broad spectrum of industry sectors, including governments, healthcare, and financial services. 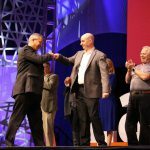 For a full schedule of exhibits, sessions and speakers, or to register please visit https://www.laserfiche.com/events/conferences/uc2009/. 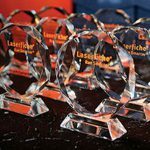 Laserfiche fosters active collaboration among clients, resellers, and third-party software developers through its Professional Developer Partnership™ (PDP) Program. Detailed descriptions of integrations, configurations, plug-ins, and Web tools created by Laserfiche PDP members can be found at the Laserfiche Marketplace™.